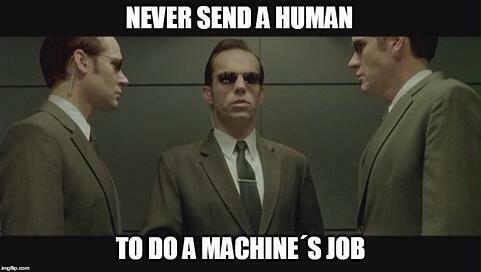 As Agent Smith stated in a Matrix movie: “Never send a human do to a machine’s job”. Our clients realized that they should switch from Power Editor to an advanced platform to start scaling and automate tasks in a real time. Come to our side as well and we will show you “how deep the rabbit hole goes” ;). In a meaning, that you will see new features which are not included in a native Facebook ads manager. E.g. you can set up automatic rules for your ads and campaigns which are activated by specific conditions, so keep calm and watch the Matrix movie while rules are checking your ads every 15 minutes. Or just spend your time more efficiently and possibly come up with a new creative campaign. If you’re starting a new campaign and you’re not sure about ads creatives, the best and fastest way is to use a right hand side type of placement and simply test it along with automatic rules. RHS ads are cheap, have the same image size dimensions as more expensive news feed ads and are shown more often so that you can get the first results in a short time. Then evaluate which creatives performed the best and promote them in the news feed. Only by testing, you can find out that age segment 45-54 works best with bidding optimized for clicks in right hand side ads, while young audience 18-24 works better with CPA bidding on carousel ads. We suggest you to track campaigns in both Facebook statistics and Google Analytics as well using UTM tagging. However setting up UTM parameters in Power Editor is not automated. You need to insert them manually or use Google Analytics URL builder. In ROI Hunter platform, these tags are added automatically and our clients have both Facebook and Google data at one place. Moreover, we integrated so called UTM wildcards so you can customize your tracking with pre-defined tags. Start a complex campaign including not just ads but also publish some posts to increase the campaign awareness. If you want more traffic on your website, go with link posts, on the other hand if you need more social engagement, try photo or album posts and play with targeting. If you see great organic reach, boost the post for bigger impact and add lookalike audience. There’s a good chance that people similar to your fans will be interested in your offer and will increase conversions. 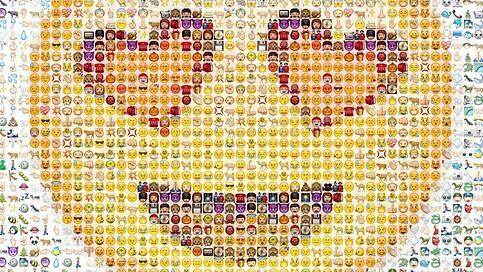 We love emojis, people loves emojis, everybody loves emojis! So does Facebook. Simply create a page post in Facebook using creative writing with emojis and measure organic reach. ROI Hunter is constantly synced with your Facebook ad accounts, pages etc. so that you can easily identify the most popular post based on the highest organic reach and boost it via our platform. You can use emojis in news feed ads as well but only in the text above the picture (not in a right hand side placement). We like this and this simple websites with emojis so give it a try. Another rising stars – GIFs – are extra popular these days. Create or copy a GIF via Giphy and use the same post boosting strategy. Wanna reach the best possible ROI, and your optimization goal is set to conversions? Then you should bid with the true value. Facebook ad auction works on the Vickrey-Clarke-Groves (VCG) model. It is an incentive-compatible auction, meaning that if advertisers bid their true value for the action that the ad is being optimized for, this can help maximize their ROI. Moreover, the bid value is often lower. The Facebook ad auction is also designed to minimizes the ability for people to “game” the auction by trying to undercut any single bidder. After an ad wins the auction, the price paid for the winning ad is based on the value lost by all the advertisers whose ads did not get shown (not just the bid of the second place advertiser). Facebook determines this lost value based on those advertisers‘ bids. If you set lower bid, you will reach people that are easily reachable, but might not provide the conversions you expect. Therefore, you can have problems to scale your campaign in a short run. We suggest you to start a new campaign with CPC on a broad and lookalike audience. Once you have 25 conversions per day with a 0,5% conversion rate based on 1-day click-through attribution model, switch to oCPM bidding with a daily budget at least 5x higher than your bid or target value. If you cannot reach the minimum conversions, check the pixel on your website and possibly move it further in the purchase funnel to event which makes a good proxy for the conversion you really care about. Don’t change the bid too soon after you started, or several times a day, give it a time to settle. Do you believe that Instagram is not a relevant channel for your business? Well, if your customers are young people then you should change your mind quickly. Since Instagram allowed sponsored ads worldwide starting from October 2015, it is not so much saturated as Facebook and it’s a great way to increase your app installs. But it’s still a challenge to have a successful ad. You need to penetrate your audience with a clever, playful, or inspiring creative. Forget about all marketing skills you’ve gained and just play around. It sounds easy but in fact, it’s a challenge! Our clients know that it’s a place to share visual moments of everyday life. Best practices for Instagram images proved that you should keep an eye on consistency, and find different ways to incorporate your brand’s logo, icon or a color scheme that’s recognizable to the audience you’re trying to reach. Our clients can also use a cool feature to run Instagram Ads from the feed. So they can create as many Instagram ads within few clicks as they wish and A/B test them. 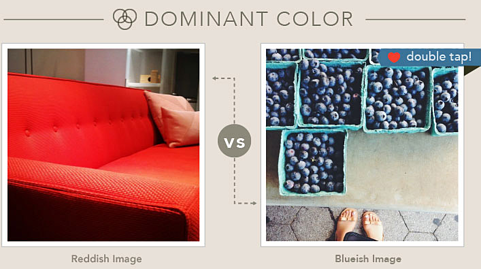 Little tips: Images with dominant blue and other cool colors are more likely to get 24% more likes comparing to the photos with red or orange warm colors. Also images with one dominant color generate more likes than images with multiple color effect. Read more. If you have more tips worth sharing, leave us a comment below this post. Looking forward to your feedback. =) Next time, we will reveal the latest hot stuff in e-commerce marketing which will help you to get on the top. Stay tuned! Only by testing, you can find out that age segment 45-54 works best with bidding optimized for clicks in right hand side ads, while young audience 18-24 works better with CPA bidding on carousel ads.